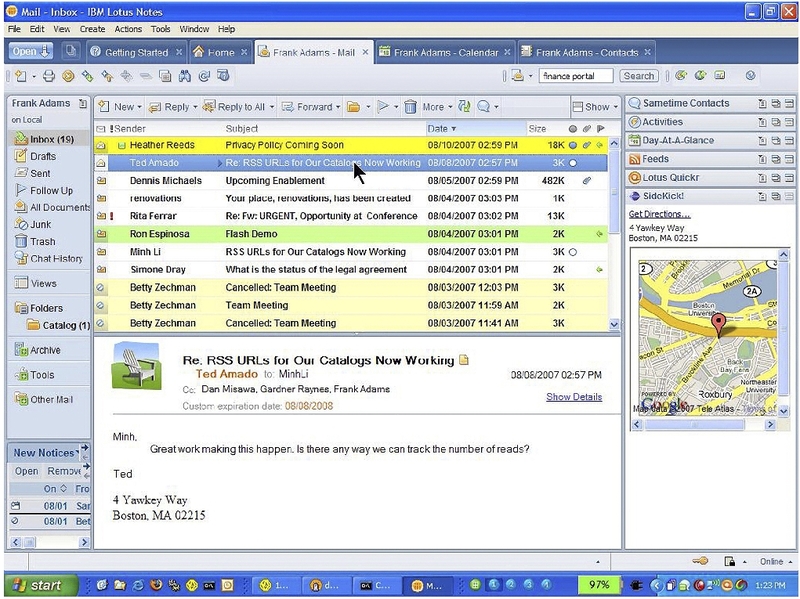 Via Ed Brill (and on schedule, as expected) the new Lotus Notes and Domino 8 (once known by the code name “hanover”) is out for all your communication, collaboration and coordination needs. Most oblivious in this release are the improvements in the UI (beyond just eye candy) and other changes in the Notes client (like running it under linux), as well as the server (consuming web services is so much easier), without having to “rip and replace”. Click here to see an image of the Mail application within the client. “Open” button for fast access to most often used applications. Conversation mode that lets you gather and review e-mail threads based on subject headers. contacts, day-at-a-glance, RSS, and ATOM Feeds. Context sensitive toolbars and customizable view preferences. Omnipresent search center for e-mail, calendar, the Web, and your desktop. (ODF), Microsoft™ Office, and IBM Lotus SmartSuite® file formats. Ability to export documents to Adobe Portable Document Format (PDF). Collaboration history that lets you search and view your collaboration history with specific people. Cross-platform support for both client and server. Multi-directory integration improvements provided through limited entitlement to IBM Tivoli®Directory Integrator that accompanies Lotus Domino 8 software. Here’s the official IBM Press Release, and from the Lotus developerWorks site more technical details or the YouTube demo of New features demonstration. Third Party review : InfoWorld. This entry was posted in LinkedIn, Lotus Domino by Ian. Bookmark the permalink. ← Previous Previous post: The Real Reason for Increaded productivity behind Scripting Languages!